An efficient security officer management system monitors and tracks security officer tour and patrols, via GPS. An efficient security officer management system must also receive mobile reporting data from those tours, by way of a security guard tracking app, in order to provide your customers with real-time (or approved) activity and incident reporting. As a security services owner, the best use of your time and resources is focusing on growing your business. You want to work on increasing your client base, and making a profit, not dealing with tracking your officers and employee performance issues, deciphering half-completed reports, managing scheduling, payroll and billing, and dealing with all the other administrative headaches that come with owning a guard business. GuardMetrics security officer management system helps streamline your operations and growth strategy, so you can spend more time winning new clients and retaining and expanding existing customer accounts, while you reduce administrative time and expenses spent on guard management. 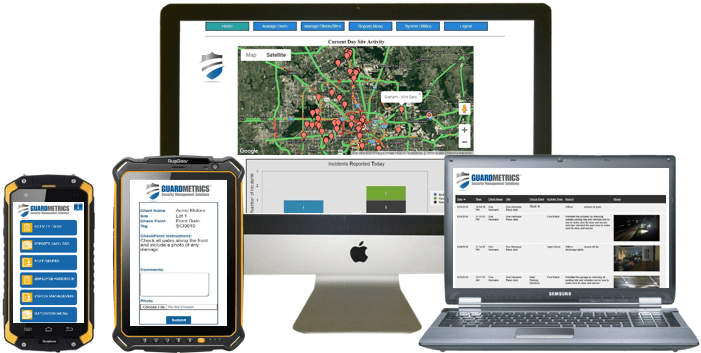 With GuardMetrics software you gather and share location and reports from the mobile officer’s app quickly, and cost-effectively. A security guard management system consolidates and automates workflow for you. With a few keystrokes you can handle every aspect of your business administration on a simple dashboard, including system-wide updates. The GuardMetrics team can offer you exactly what you need to streamline your guard business, based on your organizational needs and requirements. Save time and money with security officer management system software! Our affordable, user-friendly security officer management system virtually eliminates the need to be tied to an office! It allows you to work from anywhere, 24/7. Track your mobile officer patrols and tours, receive reports and alerts in real-time, create reports and post orders, and streamline staff production and procedures with technology, and expert GuardMetrics support, tailored to help your security guard business grow. Reduce labor time and associated costs required to run your business with a real-time, efficient and affordable security officer management system app. Then you can spend less time on administrative duties and more time executing tasks that help you grow your company and improve your bottom line. You might discover that we can help with all of that. GuardMetrics software helps you evaluate performance, monitor guard tours and create and share incident reports that provide your clients with a transparent view of your operations. You stay more productive, your officers stay on task, and your stakeholders receive clear, actionable data. The GuardMetrics officer management system is an end-to-end solution that’s a win-win for your organization and your clients! Call now for your free demo.